The Glow In the Dark Thai Beads is a soft but firm jelly with finger grip. Please note colour may vary from green, pink, blue and yellow. 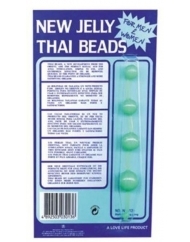 The Glow in the Dark Thai Beads has four graduated jelly beads connected by a secure jelly string lead to make removal easy and safe.